Raquel Barajas posed the question: “You know how people become afraid of things that aren’t similar to them so that causes a lot of anger and aggression?” The youth philanthropist from San Francisco plans on changing this cultural flaw plaguing public schools, which leads to widespread bullying and discrimination. She has already started the great fight as a supervisor for Youth Funding Youth Ideas (YFYI) and a member of Youth Philanthropy Connect’s (YPC) Leadership Team. Barajas is a sophomore at San Francisco State University, studying health education, with a focus on community-based health, and Latino studies. Her philanthropic journey started when she was only 15 years old and working with YFYI’s sister program, Youth Line—a phone line dedicated just for youth. After being offered the opportunity to join YFYI from there, she became a program officer and took on the tasks of attending site visits, managing budgets, supporting the other youth involved, and creating and facilitating curriculum. What is she most passionate about? She put her answer simply: “Having people get a better understanding of themselves and the people around them.” And Barajas knows first-hand how important it is to learn from others about their culture, for she said “As a white-passing Chicana, I often have my ethnicity mixed up so I feel it is important to talk about my cultural background whenever I get a chance.” That passion definitely came out when she gushed about her first ever project with YFYI: the Peace Club at an international high school. In a school where English isn’t anyone’s first language, each ethnic group formed a clique, which resulted in discrimination and bullying. “When people would attempt to speak English, they would get made fun of because it obviously wasn’t perfect,” Barajas said. The Peace Club’s objective is to help communicate better among the student body, as well as create a sense of community at the school. “Since [starting the program], bullying and fighting have dropped in percentages of how it was back in 2013 up until now, and they continue to have workshops around learning about different cultures of the youth that go there,” Barajas said. Barajas isn’t just involved in activism—she spreads the word about it, too. She was first introduced to YPC in 2014 when she facilitated a workshop at the conference in Anaheim, CA on social justice philanthropy. Barajas joined the Leadership Team shortly after that experience. She thinks of the team as a unique way to improve each organization that the members are involved in. 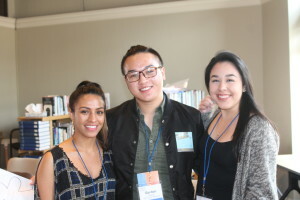 “It really allows people to really network and learn the different strengths and weaknesses that their own foundations and organizations have,” she said.